RFID technology and real-time location systems are listed among healthcare’s “it” technologies, but some believe they may infringe on patients’ and employees’ privacy. Radiofrequency identification (RFID) is an automatic identification method that uses tags, or transponders, to locate objects, animals, and even people. With the technology becoming more prominent in healthcare facilities, many questions concerning its use are cropping up: What are the privacy implications? Is RFID worth the investment? How do staff and patients feel about being tracked? RFID tags come in active and passive varieties. Active tags are always “talking”—in healthcare facilities they would most likely be placed on valuable assets or people. Active systems are also effective for finding people (a doctor or nurse) or things (a sponge left in a body during surgery) in real time. Conversely, passive tags must pass through a reader to be activated, are usually placed on items such as scrubs, and have an average reading distance of between 10 centimeters and a few meters. According to some technology experts, real-time location systems (RTLS) using RFID technology have proven valuable in the healthcare setting for improving workflow, boosting patient satisfaction, and increasing revenues. Henry Tenarvitz, president and chief operating officer of Versus Technology, Inc., sees a benefit in tying real-time location information with HIT to help healthcare facilities not only improve overall operations but also increase revenue. He adds that deploying an RFID or an RTLS doesn’t have to place a big burden on a facility’s IT department. 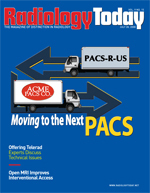 According to Dan Neuwirth, chief operating officer of Agility Healthcare Solutions, there are generally two approaches to installing an RTLS. The first uses a network of fairly independent devices that must tap into the hospital’s network at some point, depending on the facility’s technology. This strategy provides accurate tracking. Jason Howe, CEO of Awarepoint, notes several criteria that he believes contribute to successful deployment of an RTLS in a healthcare facility. “First, it must be deployed enterprisewide. Assets, whether people or equipment, move all over the hospital, so if you don’t have surveillance across the whole facility, you can’t track them properly and in a way that drives the return on investment [ROI],” he says. Howe adds that the technology must be accurate enough to identify exactly where something is when you need it. There also must be room-level and defined-area accuracy for the system to be successful. Howe believes the technology must be minimally invasive to deploy, including having no hard wires, which are too disruptive to daily business operations and take too long to install. He also recommends that it not interfere with any existing systems or applications. “It shouldn’t piggyback on another hospital network. As an example, Wi-Fi was developed to replace wired network connections for devices like laptop computers. Using the Wi-Fi network to collect sensor data for RTLS conflicts with the original design goals and can interfere with the mission-critical system,” says Howe. However, the technology must be interoperable to seamlessly integrate with other hospital information systems. This includes using an open application programming interface that is standards based and Web enabled. Introducing any form of IT at a healthcare facility can be a costly venture. For that reason, Howe says facilities considering the adoption of RTLS should be willing to assume only a low risk of failure. “There should be a low cost of entry and a low total cost of ownership. Get with someone willing to invest in your facility,” he says. Melissa Ngo, senior counsel and director of the identification and surveillance project for the Electronic Privacy Information Center (EPIC), says RFID technology raises many questions regarding privacy. She notes that consumers usually know when a credit card has been stolen and can take the appropriate steps. However, in cards with an RFID chip, if correct security protocols are not in place, the wireless technology enables information to be taken without the cardholder’s knowledge. Ngo adds that such security and privacy questions are also a concern in proposals to include an individual’s entire medical file on an RFID-enabled card. However, Neuwirth doesn’t believe privacy is an issue with RTLS tags because the system only associates the tag ID to the patient ID, whose message is simply “Here I am.” “There is no way to associate the tag ID to any details about the person. Everything related to the patient information is in a different database,” he says. “Privacy is not an issue as the technology is HIPAA compliant and HL7 [Health Level Seven] protocol compliant. Many levels of security are utilized,” Howe says. In addition to HIPAA and HL7, the hospital enforces its own privacy policies that either complement or go beyond what is integrated in the technology. A prevailing question exists as to whether it is acceptable to track people. EPIC says that applying the same technology to track individuals as is currently used to track animals or inventory is a violation of fundamental freedoms and a personal invasion of privacy. Ngo also points out that it can be a huge detriment to an employee’s productivity. “You become less productive if you have to explain every deviation from what people think is normal,” she says. “Using the technology this way is somewhat new, so it is yet to be seen if there is an aversion to tracking. We find that once patients realize how the device will benefit them, they are OK with it,” says Neuwirth. For example, patients may be tagged in the emergency department (ED) to help staff make sure they move through the treatment process as quickly as possible. Howe agrees that patients are more apt to accept being tagged if you can show them the “what’s in it for me” elements, such as being able to locate family members and decreased waiting times in the ED. Neuwirth says staff are often a bit resistant but can understand the value of using the system when the benefits are seen. Howe agrees that if staff can see it will improve workflow, they are more likely to accept the technology. “It’s important when implementing this technology to be up front with the staff and explain the benefits, listen to their concerns, and work toward a system that is mutually beneficial,” says Tenarvitz. One area where RTLS can improve workflow is when it is used to reduce the mundane, repetitive tasks that nurses and caregivers encounter on a daily basis. “A nurse typically walks nearly four miles a day per shift. Rather than go into a room to cancel a call or trip a registry light manually—which often involves tripping over a patient’s visitors, extra chairs, and other equipment— RTLS can perform the same task automatically, simply by recognizing the nurse’s presence in the room. And that makes the work more efficient and easier,” says Tenarvitz. He finds that nursing administrators recognize that if technology is doing something to improve workflow or reduce workload, they are happy to use it, especially in the face of a nursing shortage. Tenarvitz notes that an emerging area where RFID and RTLS are making headway is in allowing disparate applications to synchronize in real time at the user-interface level. Essentially, the goal is that when a caregiver steps up to a point-of-care computer, the device should be able to deliver clinical information about the patient, a list of his or her caregivers, and the charting application that is expected on that rotation. “This is a near-term goal, but when you can get to that place, it makes the people more efficient. The only thing you can do to increase efficiencies is to automate mundane tasks and save steps,” says Tenarvitz. With all the hype, do the benefits of RFID and RTLS technology outweigh the cost? According to Howe, at a minimum, the system should lower equipment-associated expenses by decreasing misplacement, lowering rental and other costs, and increasing utilization. “The system should pay for itself in these alone,” he says. Beyond the short-term ROI, Howe also looks at the ingredients necessary to achieve a long-term return. “You don’t need interoperability for those initial things, but for strategic long-term success you must enable a facility to monitor the status of the assets, map the history, measure the results, and then improve,” says Howe. Tenarvitz says some facilities that have implemented the technology have reported an ROI within six months. He notes that one area often plagued by diversion is in the ED, where there’s the problem of LWBS—patients who “left without being seen.” “LWBS decrease tremendously by simply having a system in place to track a patient who comes into the emergency department to let them know they haven’t been forgotten. It’s incremental revenue, but it really drops the bottom line and also provides for patients who are happier with your facility,” says Tenarvitz. A recent ROI study demonstrated the technology’s benefits and pointed to areas where equipment loss could be decreased. Fraai says to maximize RFID’s benefits, it is important to create carefully defined areas of use for specified devices. He found that notifying the appropriate people at the right time regarding a device allowed the technology to work as expected. “If an entire group is notified regarding the whereabouts of a particular device, the effect is lost. But we have alarms in place that are actionable for the appropriate individual,” says Fraai. Decreasing the false alarms, fine-tuning the system to meet the criteria set forth by the facility, and sending alarms to the right people allows the technology to work at its best, he adds. Fraai points out that the definition of cost goes beyond monetary expenditures. “There are a lot of intangibles—for example, the quality of work life of the employee and the time invested in looking for equipment rather than spent with the patient,” he says. As RFID use becomes more prevalent, Ngo says there is legislation in many states to restrict how it can be deployed, while EPIC tries to raise discussion regarding this important issue. “As it [RFID technology] gets bigger and bigger, you have to take a close look at the cost vs. the benefits. A lot of questions still exist, and there should be a very public and thorough discussion in terms of costs in security, privacy, and freedoms,” she says.